Today, Saturday September 10th from 4-10pm is the Mid-Autumn Festival at the An Lac Mission 901 S. Saticoy Ave. in Ventura. The event offers entertainment, activities and presents for children, and delicious traditional Vietnamese vegetarian food and drinks. All are invited to attend this free event. Tomorrow is September 11, 2011, the 10th anniversary of 9/11. 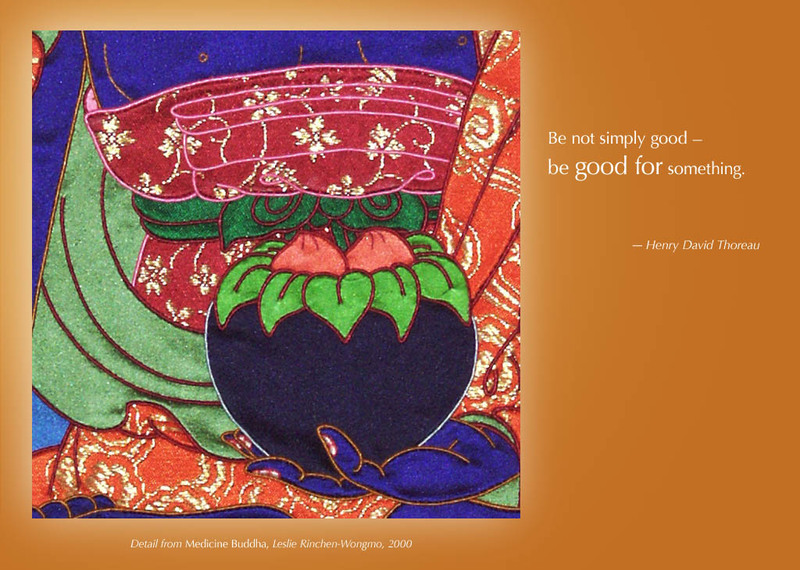 Let’s all try to do more than simply be good, tomorrow and every day. Pictured is a detail from a fabric thangka titled Medicine Buddha by Leslie Rinchen-Wongmo, a contemporary American textile artist working in a sacred Tibetan tradition. Visit www.LeslieRW.com to see and learn more and order prints. Adventures at VC: A Scavenger Hunt! Organize your time. Budget 2 hours. You will have the class period Tues. Feb. 28. After gathering information, work together to write and type a report. Make a copy of the report for each team member’s portfolio plus one for me. In “The Wedding Story,” a brave narrator attempts to tell the “perfect” wedding story while being interrupted repeatedly by the bride and groom revealing the “real” story. “The Fourth Wall” explores what a play might look like if the actors’ mistakes were actually part of the script. “Smoke Scenes” brings together two clever actors who decide to conceptualize smoke 50 different ways in 10 minutes. “Drugs Are Bad” shows how two parents deftly influence their son’s behavior. All four plays will be presented at each performance. Costumes are designed by students, and Isabelle Perez is stage manager. The Festival showcases the writing, performance, and production skills of numerous Ventura College Theatre students. For more information, contact Judy Garey, Ventura College Theatre Arts Department, email jgarey@vcccd.edu or telephone (805) 654-6400 (ext. 3236). My students can get in free to performances and write about it for extra credit or to make-up an absence.